Squared-off tread elements form an effective gripping edge for excellent year-round traction. This modern-looking radial will perform well in wet and dry weather. This design uses lateral slots in the shoulder to help ensure excellent traction throughout the life of the tire. Circumferential “see through” grooves help disperse water and slush to provide dependable all-season traction. Computer-designed to reduce noise, the different sized elements work to provide a quiet-running tire at highway speeds. A high-mileage tread cap compound is supported by a highly resilient base compound. Working in tandem, this capbase system promotes excellent durability and low rolling resistance. Dimensionally stable polyester cord improves tire uniformity by providing a more consistent carcass. 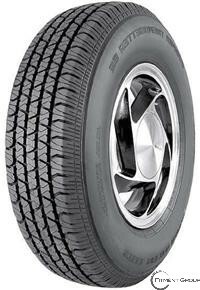 The end result is a more dependable, durable radial for value-conscious motorists.